A crown is a tooth shaped cap that is fixed over the tooth to resize and reshape and also improve the appearance of the teeth. Dental crowns are a secure way to fill gaps and help restore your smile if you have missing or damaged teeth. A crown can also help you bite and chew better, which can positively impact other systems in your body, such as a your digestive system. If the teeth is half broken and weak ,To restore that teeth use the crown. It also Cover Dental Implants. It also cover discoloured and misshapen teeth. It is use to change the cosmetic appearance. It also used to cover the missing tooth. If the cavity is there, use the crown to cover it. If had a root canal treatment, the crown will protect. Brush twice a day and floss once a day to remove plaque, a sticky film of bacteria. Be sure to see your dentist for regular Checking and professional teeth cleanings. Crowns are the different types. Crowns are Both Temporary or Permanent. temporary crowns are made of an acrylic-based material or stainless steel and can be used as a temporary restoration until a permanent crown is made in lab. 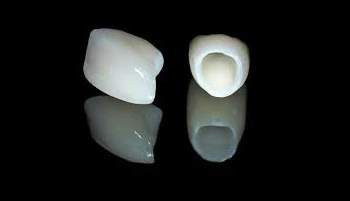 These dental crowns are very common and provide optimum aesthetic results. They look natural and can be very aesthetic. The new metal-free crowns eliminate the ugly black line you may have seen next to the gum line on older crowns. Metal free framework beneath the porcelain gives excellent aesthetic qualities to make the final restoration extremely natural looking. 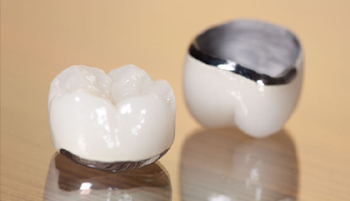 These dental crowns contain an inner metal casting ceramic baked over it. Estheticly not upto the metal free ceramic crown. WHEN IS DENTAL CROWN NEEDED? 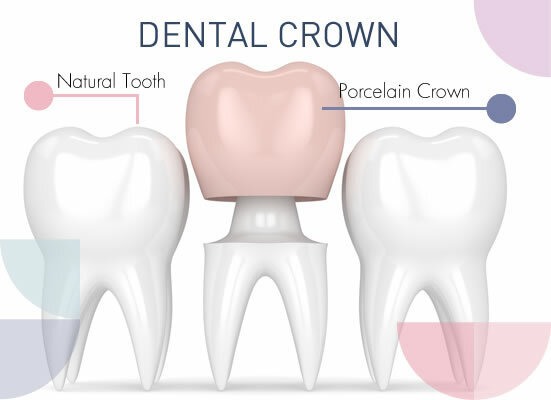 In addition, Dental Crown gives your tooth the strength, shape, size and help to improve the appearance of your tooth. If your dentist has advised, you to get a crown and you are delaying the process then there are chances that you can damage your tooth to the extent that extraction is the last resort. Moreover, not getting a dental crown can wear down other adjacent teeth causing damage.